BMW 3 Series Interior, Sat Nav, Dashboard | What Car? The driver’s seat is supportive if you’re on a long journey and holds you in place very well when you're cornering quickly. It’s a shame that, as with most BMWs, you have to pay extra for adjustable lumbar support, even on the top-spec models, but at least it isn't a pricey option. With a steering wheel that moves extensively up and down, and in and out, plus ample seat-height adjustment, you’ll not struggle to get comfortable. 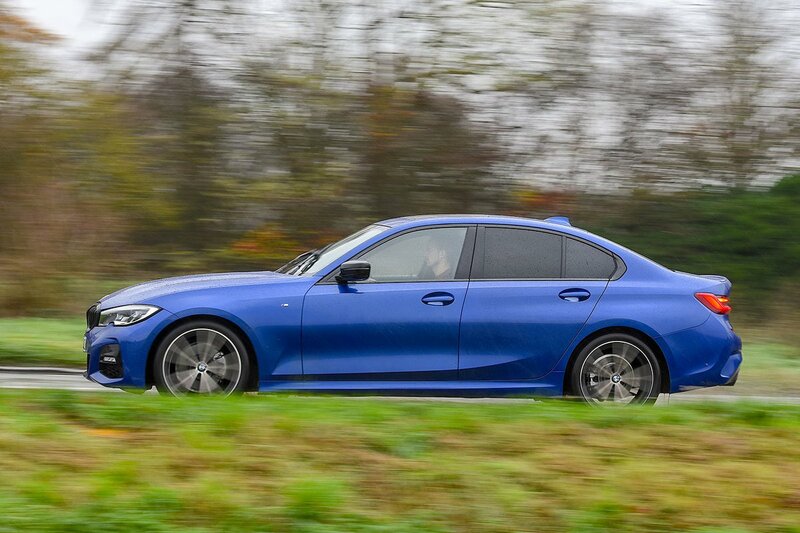 In fact, as you sit there with a large, well-padded armrest for each elbow to rest on, you might even think ‘perfect’ sums up the 3 Series’ driving position – but there is one potential issue: the pedals are offset quite a bit to the right. This is a problem that also exists in the A4 and C-Class, though, and it isn’t a major blight in the automatic cars we’ve tried so far. We’ll let you know in due course whether adding a clutch pedal into the mix causes any grief. Forward visibility is fine, thanks to reasonably slim windscreen pillars, but saloons are never the easiest of things to see out the back of. The 3 Series is no exception, with wide rear pillars and an 'invisible' boot that sticks out past the rear screen by a couple of feet. The good news is that you get front and rear parking sensors, a rear-view camera and Parking Assistant, which will find you a suitably sized space and steer you into it, as standard. At night, you’ll be particularly pleased with the high-intensity LED headlights that come as standard, which you can upgrade to adaptive laser units. These are ultra bright and allow you keep the high beams on more often by shaping their pattern of light to avoid dazzling oncoming traffic, which helps you to see farther ahead. SE and Sport trims come with an 8.8in infotainment touchscreen, which is enlarged to 10.3in if you opt for top-spec M Sport. The host of features you get include sat-nav, Bluetooth, a DAB radio and Apple CarPlay smartphone mirroring (Android Auto isn’t available), as well as subscription-based connected services that provide access to the internet. Options include the Technology Pack, which adds wireless smartphone charging, a wi-fi hotspot, a Harman Kardon premium sound system and gesture control. The latter allows you to carry out functions, such as changing the volume or answering a phone call, by sweeping your hand through the air. How easy is all this to use? BMW makes a habit of producing high-quality hardware backed up by software that’s well thought through. 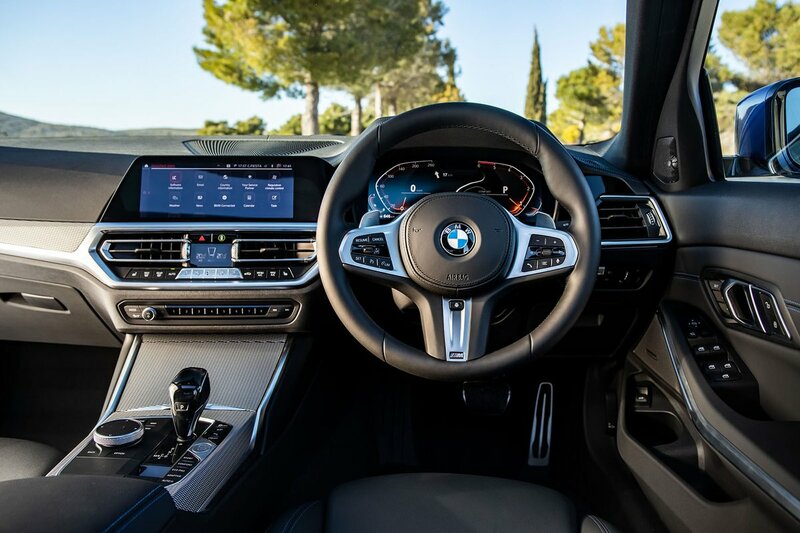 The 3 Series is no different, with a pin-sharp screen that's handy to control by touch when you're parked, but the complementary rotary iDrive controller by the gearlever proves far less distracting on the move. There’s also the Intelligent Personal Assistant, which is a natural speech voice command system along the lines of Amazon’s Alexa. You’ll find all the menus are easy to understand after a short while playing and very responsive – more so than the C-Class’s slightly laggy infotainment. Indeed, only Audi’s system in the A4 comes close, but even this lacks the added functionality of a touchscreen, and its screen is of lower resolution. In the main, the materials feel plush, but in some areas, such as the dashboard, they don’t have quite the same classy matt finish of the A4’s. Also, the sprayed plastic chrome around the heater controls looks a little low-rent, and the switches aren't as satisfyingly precise to use as the A4’s, either. 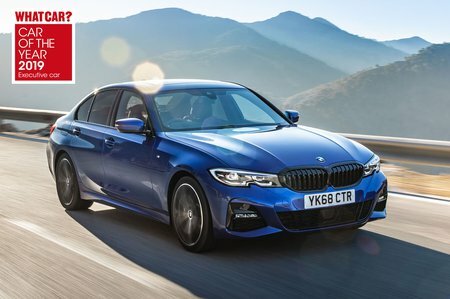 It’s our job to be picky, of course, which is what we’re doing – because while the 3 Series does lag behind the impeccably made A4, it still beats the vast majority of other executive saloons for quality.